The Garn Off-Road Loop at Llanwrtyd Wells Mountain Biking1. (00km) START from the square in Llanwrtyd Wells (GR 879 467) with your back to the Neuadd Arms Hotel. TURN R. Take the Abergwesyn road, passing the old Dolecoed Hotel and the old well houses on your left, following it for 1.7km (1m). At bridleway post l.7km. (lm) (GR 866475) FORK R and follow this metalled road, BEARING L through gate and follow to finger posted bridleway junction. FORK R and start to climb Garn Dwad. This metalled track forks R at 3km (1.9m), onto a steep stony technical section which eventually becomes easier with a wet section just before you enter the Irfon Forest at the forest gate. 2. (3.6km12.25rn) Go through gate and take the bridleway track in front of you which soon becomes a fast muddy descent to a forest X-roads junction (GR 872 494) (take care! Look out for forest vehicles). GO STRAIGHT OVER forest road and continue down the bridleway track which becomes undulating and slightly technical. KEEP R at next junction and enjoy a fast but quite technical descent. Cross the ford at the bottom at 4.2km(2.6rn) (GR 874 499) and immediately TURN R. Follow this wet bridleway which starts off parallel to the stream and then diverges away to the left and soon joins the forest road (GR 874494). TURN R. At the next junction FORK R and descend for some 400m to the next junction at the edge of the forest (GR 876492). 3. (5km/3.1m) TURN R (straight -on would take you out of the forest). The road starts to climb and you soon come to the X-roads which you crossed earlier (GR 872 494). Stay on the forest road and keep steadily climbing to the top. This is followed by a fairly straight short but fast descent to a bridleway junction (GR 868 507). 1. (00km) START from the square in Llanwrtyd Wells (GR 879 467) with your back to the Neuadd Arms Hotel. TURN R. Take the Abergwesyn road, passing the old Dolecoed Hotel and the old well houses on your left, following it for 1.7km (1m). At bridleway post l.7km. (lm) (GR 866475) FORK R and follow this metalled road, BEARING L through gate and follow to finger posted bridleway junction. FORK R and start to climb Garn Dwad. This metalled track forks R at 3km (1.9m), onto a steep stony technical section which eventually becomes easier with a wet section just before you enter the Irfon Forest at the forest gate. 4. (7.5km/4.7m) TURN L. This bridieway soon becomes a muddy descent ending with a rocky technical section onto a forest road and bridleway X-roads. TURN R and begin a steady climb of about 1.5km (just under 1 m) to a T junction (GR 860516). TURN L to start a long fast downhill of 3.3km (2m) duration (take care on the second corner but try to enjoy the great views over Abergwesyn). At the bottom of the descent you cross the river Irfon to emerge onto the Abergwesyn to Llanwrllyd road (GR 856 507). 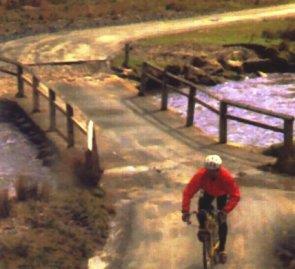 TURN L. and enjoy the 5.5km (3.5m) ride down the Irfon Valley back to Llanwrtyd Wells.